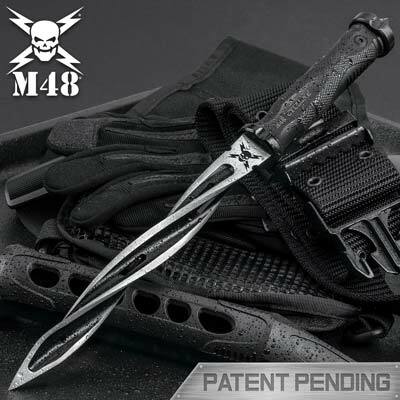 M48 Cyclone Boot Knife is 10 ½ inches in all and offers a spiral blade design. This 48HC boot knife was made with a heat process using temperatures over 1000 degrees. The 5 ¾ inch cast 2Cr13 stainless steel blade combines three spiral cutting edges and a sharp point. They have a glass breaker pommel, a solid stainless steel hand guard and glass-fiber reinforced nylon handle. They include a custom Vortec belt sheath. 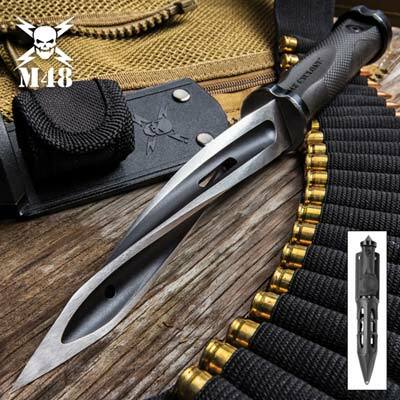 Buy the M48 Cyclone Boot Knife for $69.99. M48 Cyclone Fixed Blade Knife is 13 ½ inches in all and features a unique spiral blade design. This 48HC knife has been created by a heat process that uses temperatures over 1000 degrees. The 8 inch cast 2Cr13 stainless steel blade is a work of art that combines three spiraling cutting edges that end in a sharp piercing point. They have a solid stainless steel hand guard with a glass-fiber reinforced nylon handle. They also include a virtually indestructible custom Vortec belt sheath. Buy the M48 Cyclone Fixed Blade Knife for $99.99. 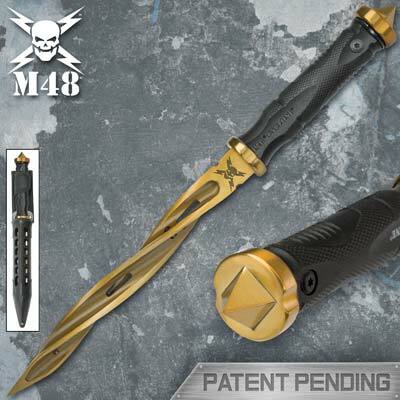 M48 Cyclone Gold Fixed Blade Knife is 13 ½ inches in all and features a spiraling blade. This 48HC knife has been heat treated to temperatures over 1000 degrees. The 8 inch cast 2Cr13 gold stainless steel blade is truly a masterpiece that combines three spiraling cutting edges and terminates in a sharpened point. These knives feature a gold color solid stainless steel hand guard with a glass-fiber reinforced nylon handle. They include a virtually indestructible custom Vortec belt sheath. Buy the M48 Cyclone Gold Fixed Blade Knife for $119.99. 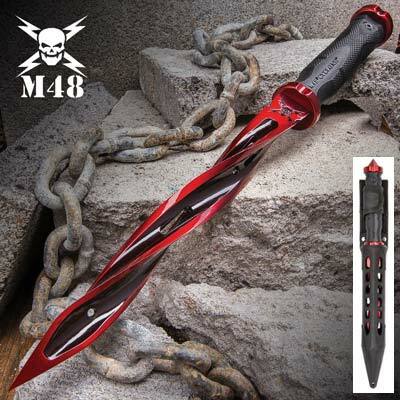 M48 Cyclone Red Fixed Blade Knife is 13 ½ inches in all and features a spiraling blade. This 48HC knife has been heat treated to temperatures over 1000 degrees. The 8 inch cast 2Cr13 red stainless steel blade is truly a masterpiece that combines three spiraling cutting edges and terminates in a sharpened point. These knives feature a red color solid stainless steel hand guard with a glass-fiber reinforced nylon handle. They include a virtually indestructible custom Vortec belt sheath. Buy the M48 Cyclone Red Fixed Blade Knife for $119.99.